ABSTRACT. The renal glomerulus, whose cellular components are developmentally derived from the mesenchyme, plays a pivotal role in filtratating plasma. Irretrievable changes of glomerular components are responsible for the initiation and progression of impaired renal function. Recently, it has been shown that functional stem cells exist in the bone marrow of adult bodies and that they can reconstitute damaged tissues of the mesenchymal origin. To examine whether the bone marrow provides stem cells to damaged glomeruli, transgenic rats carrying enhanced green fluorescence protein (EGFP rat) were established in a systemic and constitutive manner. After transplanting the bone marrow of EGFP rats into wild-type rats, the progeny of the transplanted marrow cells were tracked with a tag of EGFP. Recruitment of bone marrow-derived cells into glomeruli was dramatically facilitated in response to mesangiolysis evoked in anti-Thy1 antibody-mediated glomerulonephritis. In the restored glomeruli, 11% to 12% of glomerular cells were derived from the transplanted bone marrow. The number of bone marrow-derived CD45+ cells transiently increased during the disease process, and CD45-negative cells constantly accounted for more than half of the bone marrow-derived population in glomeruli. Bone marrow-derived Thy1+ cells kept increasing in number until the remodeling ceased and finally made up 7% to 8% of glomerular cells. Laser scanning microscopy displayed that the bone marrow-derived Thy1+ cells provide structural support for glomerular capillaries, which indicates that they are mesangial cells. Although CD45−Thy1− bone marrow-derived cells exist during the remodeling of glomeruli, none of them expressed endothelial markers such as Factor VIII and RECA1 as long as they were tested. The results indicate that the bone marrow can give rise to mesangial cells in vivo. Circulating plasma is continuously filtrated through capillaries of renal glomeruli to yield urine. Therefore, in terms of the renal function, it is critical to keep normal structure of glomerular capillaries. Three types of cells, mesangial cells, fenestrated endothelial cells and glomerular epithelial cells, are responsible for the structure. The mesangial cell especially function as a fundamental component and are essential to keep glomerular capillary lumen open and to maintain efficient ultrafiltration (1). In various renal diseases, these cellular components are damaged and, subsequently, the capillary lumen is obliterated, which leads to the loss of the renal function. Although pathologic changes of damaged glomeruli are thought to be irreversible and progressive, some glomerular components seem to have recovering potential. In cases of human poststreptococcal glomerulonephritis and human lupus nephritis, the normal glomerular structure and function can be restored in response to treatment. Even in human diabetes, which is the primary cause of the end-stage renal failure, it is reported that the normal metabolic environment achieved by the transplantation of diabetic kidneys into nondiabetic recipients or by the transplantation of pancreas to patients with diabetes regresses diabetic changes such as the thickening of mesangial matrix and capillary basement membrane (2,3). These observations indicate that damaged glomerular structures are restored under some circumstances. It should be helpful to understand healing processes of damaged glomeruli to establish strategies for treatments of human glomerular diseases. The mechanism of such regression may be at least partly analogous to the normal glomerulogenesis. Morphologic studies highly suggest that immature mesenchymal cells in the mesenchymal blastema of the developing kidney give rise to the glomerular endothelial cell, although the true origin is still controversial (4–8). The mesangial cell also seem to come from the nephric mesenchyme (4). Over the developmental process, platelet-derived growth factor (PDGF)-B and PDGF receptor (PDGFR)-β play indispensable roles in the establishment of mature glomeruli that are structurally supported by the mesangial cell. Mice deficient for PDGF-B or PDGFR-β form primitive capillaries with glomerular epithelial cells and endothelial cells but do not construct the normal mesangium that is composed of the mesangial cell and matrix proteins (9–11). In these mutant mice, glomerular capillaries show aneurysm-like structures, presumably because of the loss of the physical support that is provided by the mesangial cell. Because stromal cells surrounding the vascular cleft of the S-shaped body express PDGFR-β, they are likely to be the developmental precursor of the mesangial cell (12). Intriguingly, recruitment of extraglomerular cells is observed during the restoration of damaged glomeruli in rat experimental glomerulonephritis (13). According to observations, cells that synthesize DNA at the juxtaglomerular zone migrate into glomeruli during the healing process (13,14). Whatever types of these cells are and whatever their developmental origins are, reconstruction of glomeruli by use of extraglomerular cells is reminiscent of normal glomerulogenesis. The derivation of cells that participate in such healing processes should be studied more extensively. Accumulating evidence clearly shows that the bone marrow in adult bodies carries the mesenchymal stem cell that has multilineage potentials yielding chondrocytes, osteoblasts, adipocytes, skeletal muscle, cardiomyocytes, and hepatic oval cells (15–18). It can be assumed that adult bone marrow provides cells for remodeling glomeruli, because they developmentally come from the mesenchyme. To test this hypothesis, we have established chimeric rats that have the bone marrow of transgenic rats that express enhanced green fluorescence protein (EGFP) throughout the body in a constitutive manner. The chimeric rats allowed us to track any progeny of the transplanted bone marrow cells, using green fluorescence as a tag. In this study, we show that the bone marrow carries stem cells or progenitor cells for mesangial cells in the adult body. Mouse anti-Thy1 monoclonal antibody (ox-7) was kindly provided by Dr. Seiichi Matsuo (Nagoya University, Japan). All other antibodies were obtained from commercial sources: mouse anti-vimentin antibody (Immunon, Pittsburgh, PA), mouse anti-smooth muscle actin monoclonal antibody (Immunotech S.A., Marseille, France), mouse anti-rat monocyte/macrophage monoclonal antibody (ED1) (Serotec Ltd., Oxford, England), mouse anti-rat CD45 (Common Leukocyte Antigen) monoclonal antibody (Chemicon, Temecula, CA), mouse anti-rat RECA1 monoclonal antibody (Cosmobio, Tokyo, Japan), rabbit antilaminin polyclonal antibody (Sanbio BV, Uden, The Netherlands), rabbit anti-Factor VIII related antigen/von Willebrand Factor polyclonal antibody (NeoMarkers, Fremont, CA), rabbit anti-desmin polyclonal antibody (Bio-Science, Emmenbruecke, Switzerland), and rabbit anti-GFP polyclonal antibody (Molecular Probe, Inc., Eugene, OR). All secondary antibodies come from Vector Laboratories (Burlingame, CA). Sprague-Dawley (SD) rats were purchased from Japan SLC, Inc. (Hamamatsu, Japan) and were maintained in a specific pathogen-free environment at the animal facility of Osaka University School of Medicine. They were allowed free access to standard laboratory diet and tap water. All rats weighing 150 to 180 g (6 wk old), anesthetized by intraperitoneal administration of pentobarbital, were subjected to the experiments. All the procedures described here were approved by the animal committee of Osaka University School of Medicine. Transgenic SD rats carrying the EGFP transgene (EGFP rat) were established by use of the same construct and technique described above to produce EGFP transgenic mice (19). The expression of EGFP was under the control of the cytomegalovirus enhancer and the chicken β-actin promoter that are derived from an expression vector, pCAGGS (20). Bone marrow transplantation (BMT) was performed by use of female normal SD rats as recipients and male EGFP rats as donors. EGFP-expressing bone marrow cells were collected by flushing bone shafts of femurs and tibias of EGFP rats with BM Media (Medium-199 [Life Technologies] supplemented with 2% fetal calf serum and 2 μg/ml gentamicin). After sieved through 50-μm meshes and washed with BM Media twice, the cells were resuspended at a concentration of 1 × 108 cells/ml and kept on ice until use. Then normal SD rats were lethally irradiated at a dose of 10 Gy per animal by use of an x-ray generator. Within 4 h after the irradiation, the bone marrow cells prepared from EGFP rats were administered to each irradiated rat via tail vein (referred to hereafter as chimeric rat). The day of BMT was designated as BMT day 0. In our preliminary experiments, some recipients received tacrolimus (FK506, Fujisawa Pharmaceutical Co., Ltd., Osaka, Japan) intramuscularly at a daily dose of 0.5 or 1 mg/kg body wt from BMT day −1 to day 13. Forty chimeric rats were made and were subjected to the analysis. To induce anti-Thy1 antibody-mediated glomerulonephritis (Thy1 nephritis), anti-Thy1 monoclonal antibody (ox-7) was administered to the chimeric rats via tail vein at a single dose of 0.5 mg/kg body wt on BMT day 21. The day of the administration was designated as BMT day 21/Thy1 day 0. On the day indicated, the chimeric rats were thoroughly perfused with phosphate-buffered saline (PBS) followed by 10% buffered formalin via the abdominal aorta. Then the tissues were removed and further fixed for 3 h in 10% buffered formalin at 4°C. After being briefly rinsed in PBS, the fixed tissues were processed in one of two ways. For frozen cryostat sections, the tissues were placed in 30% sucrose in PBS overnight, embedded in Tissue-Tek OCT compound (Sakura FineTek, Tokyo, Japan), and frozen in liquid nitrogen. As long as they were kept at −70°C, the green fluorescence of EGFP was well preserved at least for 6 months. For paraffin sections, the tissues were dehydrated and embedded in paraffin wax. 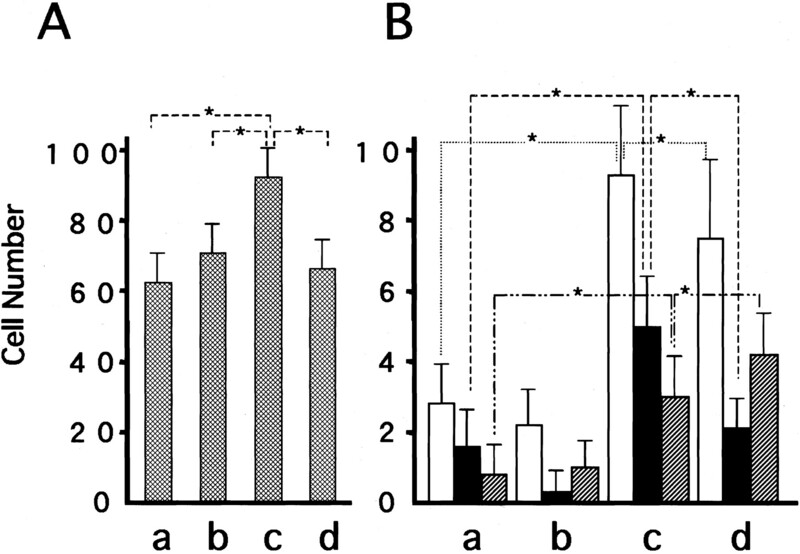 Sections cut at 4-μm thickness were incubated in various primary antibodies at room temperature for 1 h. After three washes for 5 min each in PBS, the sections were incubated in the appropriate secondary antibodies. For frozen sections, secondary antibodies were labeled with Texas Red. In paraffin sections, the localization of EGFP was visualized by use of anti-GFP polyclonal antibody in combination with an avidin-biotin detection system (Vector Laboratories). To prevent putative nonspecific binding to rat immunoglobulins, 2% normal rat serum was included in diluents for all secondary antibodies. To visualize nuclei under a fluorescence microscope, the sections were stained with 4′,6-diamidino-2-phenylindole, dihydrochloride (Molecular Probe, Inc., Eugene, OR). These processed samples were observed under a fluorescence microscope (Nikon Eclipse E600, Tokyo, Japan) or a confocal laser-scanning microscope with appropriate filters (Carl Zeiss LSM410, Oberkochen, Germany). All images were captured by a digital imaging system connected to a Macintosh computer. A primary culture of mesangial cells was established from isolated glomeruli of the chimeric rats and maintained as described elsewhere (21). The cells cultured on chamber slides (Nunc, Inc., Naperville, IL) were fixed with ice-cold methanol for 5 min and were subjected to immunohistochemistry. EGFP transgenic rats expressed EGFP as nonsecreted cytoplasmic protein throughout the body except peripheral erythrocytes and hair. Bright green fluorescence was observed in all components of the kidney under a fluorescence microscope (Figure 1A). In the chimeric rats, green fluorescence derived from EGFP that was only expressed in the transplanted marrow cells, and their progeny provided a sharp contrast with fluorescence-negative recipient tissues. Less than 5% of animals that were subjected to BMT died within 5 to 10 d, presumably because of graft failure or irradiation toxicity. In the bone marrow and spleen of the established chimeric rats, an average of 80% cells expressed EGFP at BMT day 21 (Figure 1B). FK506 that we used to obtain preliminary data were withdrawn from our protocol because we could not experience any sign of graft-versus-host disease in the absence of FK506. Figure 1. Enhanced green fluorescence protein (EGFP)+ cells fluoresce brightly in EGFP transgenic rats and the chimeric rats. (A) Frozen kidney sections from the EGFP transgenic rats. Kidney sections taken from 6-wk-old EGFP rats were observed by use of fluorescence microscopy without any staining. Cells with bright green fluorescence were clearly identified throughout the kidney. (B) Bone marrow and spleen taken from the chimeric rats. The chimeric rats on bone marrow transplant (BMT) day 21 were thoroughly perfused and fixed as described in Materials and Methods. Paraffin sections were stained with anti-GFP polyclonal antibody followed by an avidin-biotin-peroxidase detection system. Then the sections were counterstained with hematoxylin. Representative pictures of the bone marrow (a) and the spleen (b) are shown. Cells taken from bone marrow of the chimeric rats were spread onto a glass slide and were fixed with ice-cold methanol. 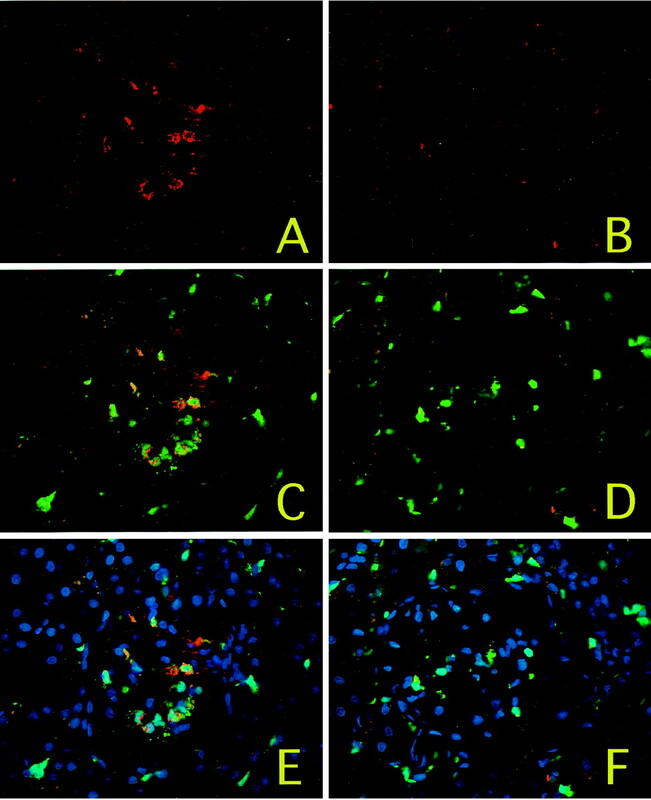 The cells were subjected to Giemsa staining and were observed by use of light (c) and fluorescence microscopy (d). Representative pictures are shown. Magnifications: ×400 in A and B (a and b), ×800 in B (c and d). In Figure 2, kidney sections taken from the chimeric rats are shown. AT BMT day 5, EGFP+ cells were observed in gaps between renal tubules and were evenly scattered from the cortex through the papilla without any foci or cluster (Figure 2). EGFP+ cells were also observed in the interstitium of all tissues we looked in, such as heart, liver, skeletal muscle, peritoneal wall, and intestine (data not shown). These interstitial EGFP+ cells were not vascular plugs mechanically entrapped during circulation, because they were localized exclusively outside vascular lumens when endothelial cells were stained with anti-Factor VIII antibody or anti-RECA1 antibody (data not shown). They did not belong to leukocytes, hematopoietic lineages, or antigen-presenting cells because a large part of the interstitial EGFP+ cells did not react with anti-CD45 antibody or anti-dendritic cell antibody as long as we tested. One distinct property is that about half of the interstitial EGFP+ cells expressed vimentin, which implies that they belong to mesenchymal cells (data not shown). Although the number of the interstitial EGFP+ cells did not show further increase during our observation up to 12 mo after BMT, they did not lodge in tissues unless irradiated animals were rescued by the successful engraftment of the bone marrow. Therefore, the interstitial EGFP+ cells observed in the chimeric rats were likely to be the progeny of the reconstituted marrow. Figure 2. Bone marrow-derived EGFP+ cells lodged in the recipient kidney. (A) EGFP+ cells fluoresced green in the recipient kidney. (B) The basement membrane was stained with antilaminin polyclonal antibody followed by Texas-Red-labeled secondary antibody to visualize the basic structure of the kidney (red). (C) Green EGFP and red laminin were merged. (D) To identify nucleated cells, the image shown in panel C was further merged with 4′,6-diamidino-2-phenylindole, dihydrochloride (DAPI)-stained nuclei. Nucleated EGFP+ cells are sky-blue, whereas EGFP− cells are dark purple. Slight background due to auto-fluorescence is observed in tubules. Representative pictures are shown at a higher magnification Magnifications, ×400. In contrast to the interstitium, glomeruli of the chimeric rats rarely carried EGFP+ cells (Figure 2). It is a relevant and intriguing question whether bone marrow-derived cells are involved in the remodeling process of glomeruli. To elucidate the relationship between bone marrow-derived cells and the remodeling of the glomerulus, we adopted anti-Thy1 antibody-mediated glomerulonephritis (Thy1 nephritis), a well-established self-limiting disease. In Thy1 nephritis, normal mesangium is disrupted (mesangiolysis), which is followed by glomerular remodeling to restore the original structure. 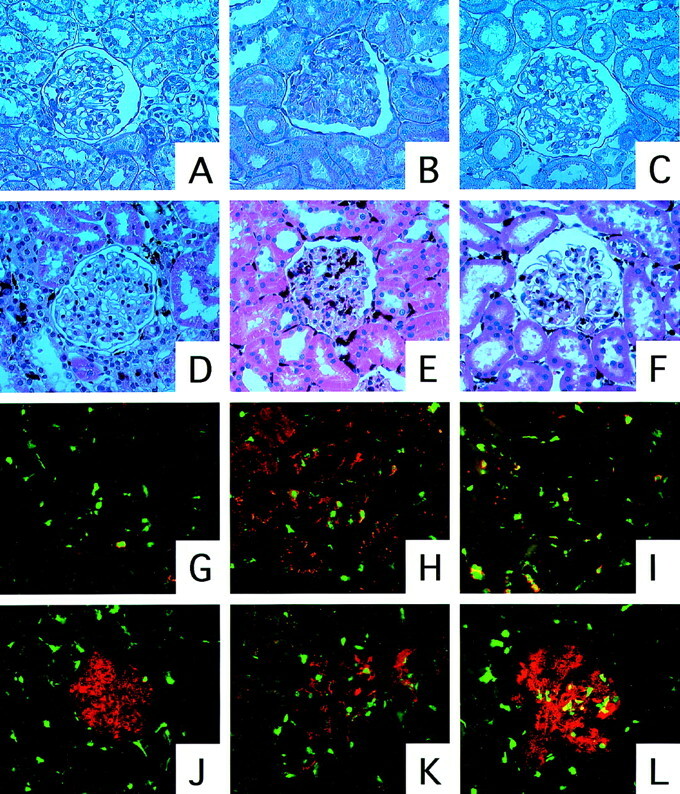 Histologic changes of Thy1 nephritis observed in the chimeric rats were consistent with those in normal rats and in studies published elsewhere (Figure 3 A through C). Seven days after the administration of anti-Thy1 antibody (BMT day 28/Thy1 day 7), the number of both EGFP+ cells and nucleated cells in glomeruli significantly increased (Figures 3, A through C and 4). It is obvious that the engrafted bone marrow contributed to glomerular hypercellularity as well as EGFP-negative cells that were derived from the recipient kidney itself and/or the recipient marrow surviving the irradiation. When compared with BMT day 21/Thy1 day 0, five times more EGFP+ cells were observed in glomeruli on BMT day 28/Thy1 day 7 (Figure 4). Interestingly, only half of the EGFP+ cells expressed CD45, which is expressed on the cell surface of various hematopoietic cells, including lymphocytic lineages, monocytic lineages, granulocytic lineages, and erythroid lineages at different levels (22). Normal glomerular structure was restored by 8 wk after onset of the disease (BMT day 77/Thy1 day 56) (Figure 3, C and F). Consistently, the number of intraglomerular CD45+EGFP+ cells and nucleated cells on BMT day 77/Thy1 day 56 returned to the baseline value (Figure 4). However, the total number of intraglomerular EGFP+ cells still remained four times higher than that estimated on BMT day 21/Thy1 day 0, and 60% to 70% of intraglomerular EGFP+ cells were CD45-negative (Figure 4). These results indicate that glomeruli on BMT day 77/Thy1 day 56 comprise a greater number of bone marrow-derived cells without CD45-positive hematopoietic properties than glomeruli on BMT day 21/Thy1 day 0. Between BMT day 77/Thy1 day 56 and BMT day 344/Thy1 day 326, there were no further histologic changes, and the number of EGFP+ cells did not change (data not shown). Figure 4. Intraglomerular Thy1+ EGFP+ cells kept increasing in number during the time course of Thy1 nephritis. The number of nucleated cells in glomeruli was counted by staining 4-μm-thick sections with DAPI. The results were obtained from 30 glomerular sections at each time point. (a) BMT day 21/Thy1 day 0 (Control); (b) BMT day 84 (Disease Control); (c) BMT day 28/Thy1 day 7; and (d) BMT day 77/Thy1 day 56. Each value is expressed as mean ± SD per glomerular section. (A) The average number of intraglomerular nucleated cells in a 4-μm-thick sections. (B) The number of EGFP+ cells, CD45+EGFP+ cells, and Thy1+EGFP+ cells in glomerular sections were counted by use of fluorescence microscopy equipped with a two-channel filter. The white bar is the number of EGFP+ cells, the solid bar is the number of CD45+EGFP+ cells, and the hatched bar is the number of Thy1+EGFP+ cells. The results were analyzed by nonpaired t test (*P < 0.01). As expected, macrophages participated in the pathologic change that was observed in Thy1 nephritis. When stained with anti-monocyte/macrophage antibody (ED1), ∼30% of EGFP+ cells in glomeruli on BMT day 28/Thy1 day 7 reacted with ED1 (Figure 5), and ED1+EGFP+ cells were responsible for half of the ED1+ cells in glomeruli at this time point. EGFP+ cells on BMT day 77/Thy1 day 56 were almost ED1-negative (Figure 5). We could not stain EGFP+ cells with anti-CD45 antibody and anti-monocyte/macrophage antibody simultaneously, because both belong to mouse IgG. Nevertheless, our data indicate that CD45+EGFP+ cells and ED1+EGFP+ cells overlapped. Figure 5. Infiltration of ED1+EGFP+ cells into glomeruli. Kidney specimens taken from Thy1 day 7 (A, C, and E) and Thy1 day 56 (B, D, and F) were subjected to the analysis. 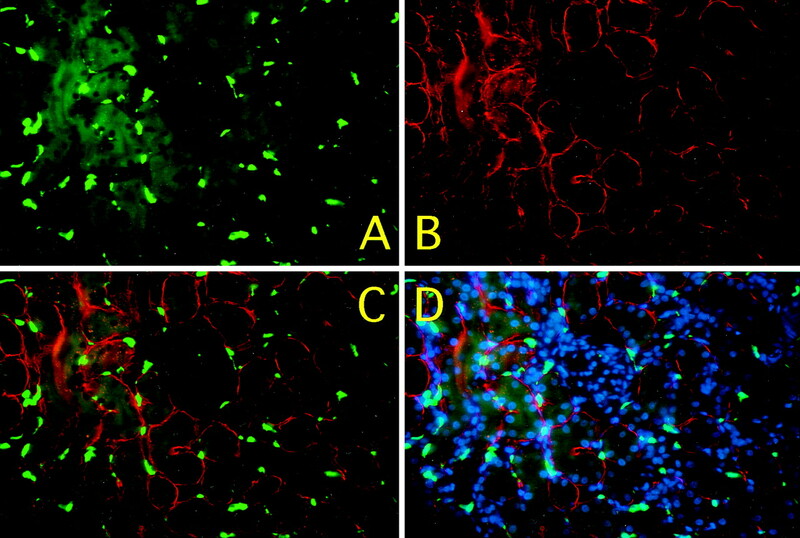 (A and B) Macrophages were stained with anti-monocyte/macrophage monoclonal antibody (ED1) (red). 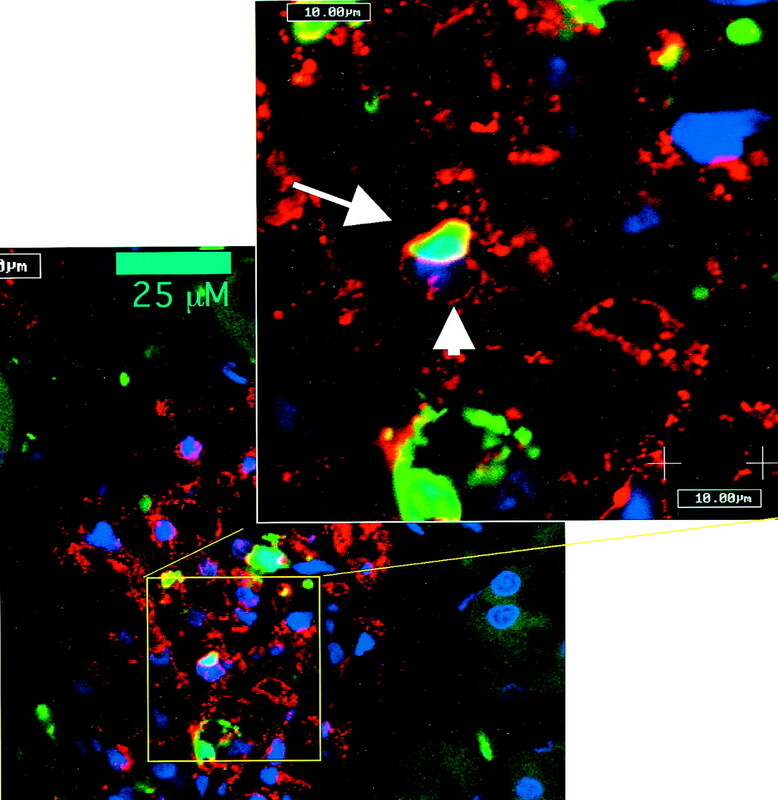 (C and D) ED1+EGFP+ cells were identified especially in glomeruli on Thy1 day 7 (orange). (E and F) Nuclei were visualized with DAPI (dark purple) and merged with the image shown in (C) and (D). Nucleated EGFP+ cells show sky-blue. Additionally, no rat IgG was deposited in the kidney of the chimeric rats as far as we tested using anti-rat Ig G antibodies. It indicates that EGFP that could be released from dying EGFP+ cells was not immunogenic in the chimeric rats (data not shown). Thy1 antigen is a glycerophosphatidylinositol-anchored protein expressed on the cell surface. In rats, Thy1 antigen is unique to mesangial cells within the kidney in vivo and in vitro (23,24). Thy1 antigen has been extensively used as a reliable marker for the rat mesangial cell. In this study, we identified mesangial cells in vivo by the expression of Thy1 antigen. The total number of intraglomerular Thy1+EGFP+ cells and the proportion of Thy1+EGFP+ cells to all EGFP+ cells continuously increased over the disease process and reached the maximum value on BMT day 77/Thy1 day 56 (Figures 3, J and K, and 4). This pattern was quite distinct from that of the intraglomerular CD45+EGFP+ cells. Because the number of nucleated cells already returned to the basal value on BMT day 77/Thy1 day 56, the net increase of Thy1+EGFP+ cells between BMT day 28/Thy1 day 7 and BMT day 77/Thy1 day 56 were unlikely to result from persistent migration or proliferation of EGFP+ cells. Simple calculation based on Figure 4 suggests that Thy1+EGFP+ cells belong to the intraglomerular CD45-negative EGFP+ cells. There was another EGFP+ population with a characteristic of CD45−Thy1−. On BMT day 77/Thy1 day 56, at least 20% of intraglomerular EGFP+ cells seemed to be negative for both CD45 and Thy1 (Figure 4). CD45−Thy1−EGFP+ cells might include endothelial lineages, but no EGFP+ cells in glomeruli expressed endothelial markers such as Factor VIII and RECA1 as long as we tested (data not shown). Even though green fluorescence that overlapped red fluorescence of stained Thy1 antigen is a conclusive evidence to prove the existence of marrow-derived mesangial cells, superposition of cell bodies or of intricate processes might be present at different levels in specimens. To obtain higher resolution, we scanned tissue sections using confocal laser-scanning microscopy. 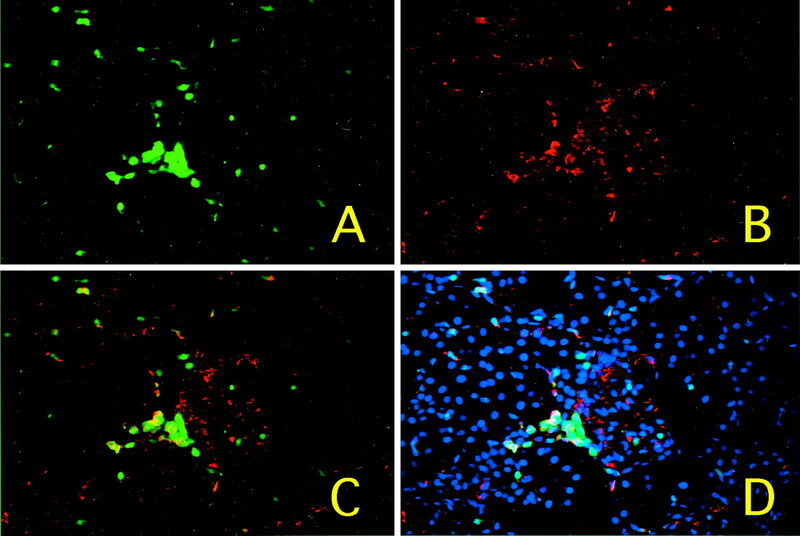 Pictures shown in Figure 6 depict the representative image of Thy1+EGFP+ cells. A sky-blue cell located at the peripheral area of the mesangial stalk is nucleated marrow-derived cell because the dark purple nucleus stained with 4′, 6-diamidino-2-phenylindole, dihydrochloride displays sky-blue in combination with EGFP fulfilling the cytoplasm (Figure 6, arrow). It is obvious that the sky-blue cell expresses Thy1 antigen on its cell surface, and that the cell does not overlap with other Thy1+ cells (Figure 6, arrow). This Thy1+EGFP+ cell extends terminal processes that border capillary lumen. At the same time, dark purple nuclei of endothelial cells within the capillary lumen are easily detected (Figure 6, arrowhead). As a whole, the Thy1+EGFP+ cell seems to provide structural support to a pair of capillary lumens. We have concluded that this cell is a bone marrow-derived mesangial cell because all these findings meet the geometry of the mesangial cell (25). In vitro culture of glomeruli isolated from the chimeric rats yielded desmin+EGFP+ cells, which also meet the mesangial property (26) (data not shown). Figure 6. Analysis of glomeruli by a confocal laser-scanning microscope. Four-micron-thick cryostat sections from the kidneys on BMT day 77/Thy1 day 56 were stained with anti-Thy1 antibody and DAPI, as described above. Then the sections were observed by use of confocal laser-scanning microscopy. EGFP+ cells and nuclei present as green and dark purple, respectively. Nucleated EGFP+ cells are identified as sky-blue cells. Thy1 antigen fluoresces red. The white arrow indicates nucleated Thy1+EGFP+ cells, and the white arrowhead indicates a pair of capillaries containing dark purple nuclei of endothelial cells. A representative picture is shown in a three-color channel mode with a scale bar. We are intrigued with routes that bone-marrow-derived cells take before reaching glomeruli. At least two possibilities can be hypothesized. One possibility is that cells in blood circulation pass through the glomerular endothelial barrier and get in the mesangium. Alternatively, cells may enter glomeruli through the interstitial tissue and the juxtaglomerular zone. Although it is technically difficult to prove which routes they take, the latter possibility was reported by Hugo et al. (13). Consistent with their report, we occasionally met a cluster of EGFP+ cells at the glomerular vascular pole after the induction of Thy1 nephritis (Figure 7). Cells forming the clusters expressed vimentin (Figure 7) but not Thy1. This population might be derived from vimentin+EGFP+ cells that lodged in the interstitial area soon after BMT. So far, we do not have any evidence to prove that vimentin+EGFP+ cells at the vascular pole enter glomeruli and subsequently change into Thy1+EGFP+ cells. Figure 7. EGFP+ cells ormed clusters at vascular poles of glomeruli. Cryostat sections from the kidneys on BMT day 24/Thy1 day 3 were stained and were observed by use of fluorescence microscopy. (A) EGFP, (B) vimentin, (C) the merging of EGFP and vimentin, and (D) the merging of EGFP, vimentin, and DAPI. A representative image is shown. Magnifications, ×400. Here, we have established and used EGFP transgenic rats instead of EGFP transgenic mice that we produced before (19,27,28) because we can take advantage of a well-established mesangial marker, Thy1 antigen, and of self-limiting Thy1 nephritis. We previously reported that GFP mice in which wild-type GFP was driven by the same promoter as we used here expressed GFP specifically in glomerular epithelial cells but not in other renal components, including mesangial cells (27,29). The construct harboring EGFP instead of wild-type GFP, however, provides brilliant stable expression of the green fluorescence protein throughout the body of EGFP transgenic mice, with the exception of peripheral erythrocytes and hair (19,27). Similarly, the EGFP transgenic rats we established here expressed EGFP in all renal components as well as in other tissues (Figure 1). EGFP is used as a powerful marker to track multipotent hematopoietic cells and their progeny in bone marrow chimeras when EGFP+ bone marrow cells are transplanted into normal mice (28). In this study, by visualizing the progeny of transplanted marrow cells in the chimeric rats, we have demonstrated that bone marrow can give rise to mesangial cells in vivo. Generally, the definition of mesangial cells is not simple because there are no universal markers. However, Thy1 antigen of the rat kidney is the exception. Thy1 antigen is expressed uniquely on the surface of rat mesangial cells both in vivo and in vitro but not that of circulating rat lymphocytes (23,24,30,31). Moreover, anti-Thy1 antibody, when administered systemically, produces mesangiolysis followed by refractive regeneration of glomeruli (32,33). Therefore, Thy1 antigen is of special value in experimental nephrology of the rat and has been used as the most reliable marker to define rat mesangial cells. Morphologically, mesangial cells in vivo possess several characteristics: they are located in the mesangial area, interconnect branches of capillaries, and physically support them (25). These morphologic traits helped us to identify mesangial cells in combination with the expression of Thy1 antigen. According to our analysis, 7% to 8% of mesangial cells were replaced by bone marrow-derived cells whereas 11% to 12% of glomerular cells were derived from bone marrow in reconstituted glomeruli. This number is not so high; therefore, most of the glomerular regeneration should be provided by locally proliferating mesangial cells. It is already reported that a part of glomerular cells originates from bone marrow (34–36). In normal glomeruli as well as glomeruli injured by nephrotoxic serum or puromycin aminonucleoside, bone marrow-derived cells that express leukocyte antigen are identified in the mesangial area, and some of them express Ia antigens (34–36). These marrow-derived cells are responsible for ∼3% to 7% of the total glomerular cells, and the number of leukocyte antigen-positive cells increases by threefold during the course of experimental nephritis (34,35). The existence and the kinetics of leukocytes such as CD45+EGFP+ cells and ED1+EGFP+ cells in our chimeric rats burdened with Thy1 nephritis are reminiscent of these reports (Figures 3 and 4). However, it is noteworthy that CD45-negative EGFP+ cells always exist with or without Thy1 nephritis and that the number and the proportion of Thy1+EGFP+ cells kept increasing even after the number of CD45+EGFP+ cells decreased (Figures 3 and 4). In other words, bone marrow-derived cells other than hematopoietic lineages are apparently involved in the restoring process of the glomerular structure that is compromised by mesangiolysis. The migrating and differentiating process of bone marrow-derived mesangial cells is still a mystery. We speculate that they are the progeny of Thy1-negative EGFP+ cells in glomeruli, because we never saw Thy1+EGFP+ cells around glomeruli that were being repaired and because the proportion of Thy1+EGFP+ cells to all EGFP+ cells in glomeruli constantly increased (Figure 4). Although the increase of bone marrow-derived mesangial cells might result from in situ proliferation of scarce Thy1+EGFP+ cells that lodged in glomeruli before Thy1 nephritis, our observation that Thy1+EGFP+ cells did not form any cluster in glomeruli suggest that in situ proliferation does not play a major role. It is more likely that Thy1-negative EGFP+ cells migrated into glomeruli and gave rise to intraglomerular Thy1+EGFP+ cells during the process of Thy1 nephritis, because the ratio of Thy1+ EGFP+ cells to Thy1-negative EGFP+ cells increased over time. Moreover, it has been suggested that extraglomerular cells in the juxtaglomerular zone are responsible for the repopulating mesangial cells in Thy1 nephritis (13). They report that extraglomerular cells enter S-phase in response to mesangiolysis and then enter remodeling glomeruli. Clusters of vimentin+EGFP+ cells, which we identified at the vascular pole, are consistent with their results (Figure 6). It is an intriguing hypothesis that clustered vimentin+EGFP+ cells share some properties with metanephric mesenchymal cells that express PDGFR β and vimentin, which should include mesangial precursors (12). Developmentally, mesangial cells originate from the mesenchyme. Numbers of experiments have shown that bone marrow carries mesenchymal stem cells that possess developmental plasticity and proliferative properties. However, the contribution of bone marrow-derived cells to adult tissues is small as long as we tested using marrow-transplanted animals (16,17). Integrated marrow cells occupy only ∼1% of total cells in tissues (16,17). We obtained slightly higher efficiency in replacing mesangial cells with bone marrow cells, but it is still low. We, as well as other researchers (16,17), speculate that the contribution of marrow-derived cells is masked by repopulating native cells that survive injuries. Alternatively, stem cells in the transplanted marrow may replace only a part of the stem cell pool that supposedly exist in tissues including the kidney. In fact, parenchymal mononuclear cells that might include immature mesenchymal stem cells are replaced by bone marrow-derived cells at a rate that depends on types of tissues (37). Purification and enrichment of stem cells from bone marrow or peripheral blood is effective to overcome this obstacle, at least in liver, skeletal muscle, and heart (38–40). Therefore, we are trying to purify mesangial precursors from bone marrow now. Finally, it is widely accepted that a subpopulation of stem cells in bone marrow or peripheral blood can differentiate into endothelial cells that contribute to angiogenesis and re-endothelialization of adult tissues (41,42). In contrast to our expectation, bone marrow-derived cells replaced a part of mesangial cells, but not at all endothelial cells as long as examined by the expression of Factor VIII and RECA1. One of rational explanation is that endothelial cells that survive mesangiolysis proliferate and restore the glomerular endothelium. Given that case, more extensive and specific ablation of glomerular endothelial cells might lead to the integration of bone marrow-derived endothelial cells. Endothelial cells in adjacent arterioles may also migrate and repair injured capillaries. At least the efficiency of BMT should not be a major factor here, because 80% of marrow cells are replaced with EGFP+ cells in our chimeric rats. To exclude the possibility that whole-body irradiation damaged the microenvironment, playing a pivotal role to expand endothelial lineages, we are establishing another experimental system, a renal transplantation model in which GFP rats and normal rats are assigned as recipients and donors, respectively. In the future, we hope that it is made possible to control the remodeling of injured glomeruli using mesenchymal stem cells, which may save kidneys that pass “the point of no return.” We believe that our approach will be helpful to provide clues for such cell therapies. We thank Dr. Seiichi Matsuo (Nagoya University, Japan) for providing mouse anti-Thy1 monoclonal antibody (ox-7) and Fujisawa Pharmaceutical Co., Ltd. (Osaka, Japan) for providing FK-506. This research was supported by a Grant-in Aid for Scientific Research from the Ministry of Education, Science and Culture, Japan, by a grant from Takeda Medical Research Foundation, and by a grant from the Osaka Kidney Foundation (OKF 01-0009). How Do Mesangial and Endothelial Cells Form the Glomerular Tuft? Different Types of Cerebellar GABAergic Interneurons Originate from a Common Pool of Multipotent Progenitor Cells. Stem Cells and the Kidney: A New Therapeutic Tool?